Energy-awareness practitioners Stephen and Lynda Kane examine ways of dealing with the dark state of depression and negativity that we can fall into from time to time, especially under such aspects as are now active. They call this experience the "gollum state", because, like Gollum in "Lord of the Rings", it is characterized by repeatedly expressing negative or unhappy thoughts to oneself and feeling cut off from everyone else. Gaining control over negative energy patterns is what it's all about! Have you ever had the feeling of being trapped in a negative state that you can't get out of—even though you want to? It could be one of feeling angry, resentful, frightened, jealous, sad, lonely or anything else that is a "downer" and just goes on and on. You may feel trapped inside yourself, unable to speak or reach out for help, unresponsive to others. There's a part of you that really wants to feel different—that wants to "snap out" of it—but you just can't shake the "black cloud" that's settled on you. We call this experience the "gollum state" — named after the well-known character in Lord of the Rings—because, like Gollum, it is characterized by repeatedly expressing negative or unhappy thoughts to oneself and feeling cut off from everyone else. The gollum state may last just a few hours—or a few minutes for kids—or several days. If it becomes permanent, it is given a name like "clinical depression," or some other term that describes a form of psychological illness. Usually, the gollum state ends with a change of experience like, say, waking up to a sunny morning, receiving a bouquet of flowers, hearing some heartfelt music, seeing a gripping movie, or being with the right people. Sometimes it takes a shock: a friend told us how she had been "down" for days, then a man had a sudden heart attack immediately in front of her at a theater and she immediately snapped out of the sullen, miserable mood she described as the "black spider" that occasionally descended on her. Just as a temporary gollum state often ends with a new experience, it also usually starts with one. Maybe someone else says or does something that triggers a sudden change of mood in you—especially when you are tired or stressed and so much more vulnerable to external influences. Of course, the gollum state may also be associated with other well-known conditions, including the menstrual cycle, personal biorhythms, the phases of the moon, food hypersensitivities or even your horoscope. However, regardless of the triggers that switch the gollum state on and off in a person, let's look at what's actually happening when you're feeling "down" — and then ceases to happen when you feel better. However, when we suffer an obstruction of our internal energy, this causes the experience of an external reason for the consequent bad feeling. But the bad feeling is simply because your 4th chakra is not getting all the energy it needs from another area of your body—regardless of your "good" reasons for feeling bad. There are always other people who've had similar experiences—and thus the same good reasons for feeling bad—but who don't feel bad or, at least, not so much. 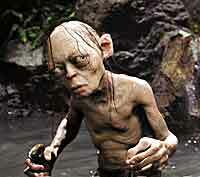 The gollum state is always a product of an internal energetic condition. It is not, essentially, caused by any particular event that, in itself, forces you—and all others in the same situation—to feel unhappy. The reason the energy flow to your 4th chakra becomes obstructed is that a foreign energy—an energy from outside your body—has entered and partially blocked a channel of energy from another chakra. Just like infections, foreign energies are entering your body all the time; but, for the most part, your natural energetic immunity automatically eliminates them. But when you are in the gollum state, your energetic immune system is having trouble getting rid of a foreign energy—and you are experiencing the consequences. An experience that enables you to move out of the gollum state is one that contains the energy your energetic immune system needs to eject the foreign energy. The reason that kids tend to stay emotionally "down" for much shorter periods of time than adults is that their energetic immunity is usually much stronger than that of adults. The reason that some people become permanently down—often starting in their teens or a little later—is that they can't muster the energy they need to eliminate the foreign energy that is blocking their 4th chakra. Instead, they take medications—Prozac being a well-known example—or develop strategies that they find help them "get through" the day; but their natural joie de vivre is permanently "short-circuited" by the foreign energy that has stabilised near their hearts. For those who only sometimes fall into the gollum state, there is a simple movement or weave* that strengthens the energetic immunity of every major channel entering the 4th chakra, against invasive foreign energies. Practicing this weave, on a regular basis, expands the energy of your 4th chakra in all directions. This not only protects you against the gollum state but also steadily cultivates your happiness and joy of being alive. Thus, it makes a profound difference to your real quality of life, over time. Understand what your experiences are showing you you need to do in order to become well (or more well). This weave also helps you restore and raise the energies that generate a happy and fulfilling life through developing your energy awareness. It is called Accepting Now as it destroys the karmas (invasive foreign energies) that weaken and damage your awareness through causing you to cling to past or desired future states, experiences or relationships. Since the following weave includes some stretching and breath retention, ask your doctor before doing it if you are unfit in any way. In this weave, you always inhale through your nose and exhale through your mouth. Keep your fingers splayed throughout the weave. 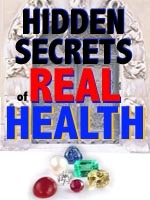 NOTE: + = "at the same time"
You can find more detail about each of these seals in Chapter 5 of Hidden Secrets of Real Health. Practising Accepting Now brings more and more awareness energy up to your face. As this higher awareness grows, you will find yourself increasingly able to deal with the ups and downs of your life with the equanimity and inner strength that automatically results from steadily, effectively, cultivating your energy. Note: Accepting Now is not a substitute for clinical treatment for a diagnosed problem. It is an energy-cultivating exercise for developing consciousness beyond its usual limitations. * A weave is an empowerment exercise that draws energy down from your spirit point. 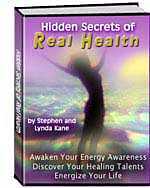 This spiritualizing energy eliminates life-damaging foreign energies from your body. Lynda and Stephen have worked together for over 15 years, having come from such disparate backgrounds as Chief Psychologist for British Airways and Director of the Institute for Advanced Health Research and Arcadia - a group focused on the cultivation of many forms of higher awareness. They now run Time for a Change at www.realhealth-online.com—a web-based entry point for anyone interested in developing the energies that determine their quality of life and their awareness of human and environmental energy.